Decisions, Decisions. Choosing from among the many fantastic restaurants in Charleston, South Carolina can be overwhelming, particularly if you have a limited amount of time to experience it all. A food crawl, where you select one food item and one drink at each restaurant, is a great way to sample the variety that the city has to offer. Charleston is perfect for food crawling, with restaurants lining the streets of each neighborhood. On a recent visit, we met up with some local Charleston friends to explore the city. We started in the French Quarter, an area within the original colonial walled city of Charleston, and spent a cool rainy day nibbling our way down the sidewalk. 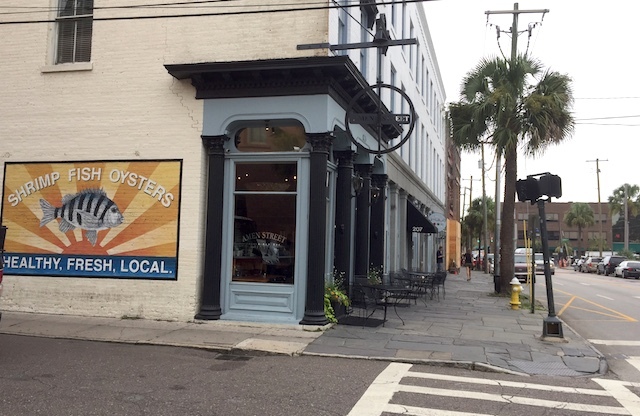 We started on East Bay Street at the Amen Street Fish and Raw Bar, a popular seafood restaurant in a beautifully restored historic mercantile building. The space was filling quickly at prime lunchtime and we were lucky to score a table for four. Amen Street supports local fisherman, so the South Carolina oysters were an easy choice from the raw bar. A glass of unoaked Chardonnay was a nice clean match for the mild, crisp oysters. The special of the day, a soft-shell crab sandwich with bacon and garlic aioli, was hefty enough to share between two of us. We also added an artfully arranged roasted beet salad with pea tendrils to supply a healthy start to our afternoon. 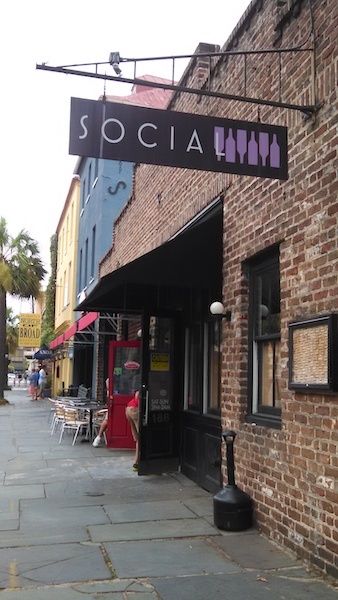 *Update: Social Wine Bar closed permanently as of July 2015. Just across the street, the Social Wine Bar offered wine flights and a full menu of wine-friendly treats. The atmosphere of this 19th century warehouse is casual modern industrial; the kind of place where you could hang out all day drinking wine. Each of the four of us selected a different wine flight, and there wasn’t a bad glass in the bunch. The traditional Spanish Tapas plate contained a nice assortment of meats, roasted olives, and cheese; but the highlights of the plate were preserved lemon-stuffed figs that were sweet and tangy with an unexpected burst of concentrated citrus. Needing a little walk, we headed west down Queen Street, peering into the art galleries and sneaking peeks into the charming alleys where lush landscaping overflowed the narrow spaces. A few blocks away, The Bar at Husk provided a nice interlude in the feast. The downstairs bar was packed in those mid-day hours when the kitchen at Husk is closed, so we headed up the stairs. The attic-like upstairs of this century old building, with exposed rafters and inviting lounge chairs, set the mood perfectly for a cocktail. A basil and black pepper infused vodka with grapefruit, strawberry and mint was one of the tastiest creations I’ve tried so far in this current craft cocktail scene. I was so enamored of my own drink that I couldn’t even tell you what the others were having, but I do recall the smiles around the table. Our server informed us that there was no food at this time of day—but they did have ham. Food or not, of course we had to try the ham—a rich, salty, locally cured Surryano sliced from the leg, several of which were hanging in the rafters above us. As tempting as it was to spend the afternoon lounging in this old building with cocktails and ham, we had to move on. FIG consistently receives rave reviews, and was therefore a required stop on our journey. Without a reservation, we rushed back up Meeting Street to arrive at FIG before the dinner crowd filled the bar. Regrettably, we were too late and were instead seated at a large communal table near the front door. Without the close attention of the bartender, this made for a long wait. But it was worth it. Soft-shell crabs were in season, so the special was, of course, sautéed soft-shell. I firmly believe that I should eat as many as possible during the season. Lucky me, their preparation was nearly faultless with a crispy shell on the outside and juicy meat on the inside. However, it was the ricotta gnocchi that deserves the raves, with melt in your mouth, ricotta-stuffed puffs swimming in a lamb Bolognese. We selected an Italian Barolo that was the perfect wine to compliment the rich sauce. Our thoughts finally turned to something sweet. The elegant bar at the Peninsula Grill, famous for its coconut cake and bubbly, is the perfect choice when selecting a spot for dessert. The 12-layer slice of cake was almost 6 inches tall with smooth coconut icing alternating between 6 layers of cake. A lighter, fluffier cake could have been tackled by one person, but this cake was dense and rich. Even shared by two, we struggled to finish the slice. They have a nice selection of sparkling wines, including Champagne, Cava, and Prosecco to fit any budget. We chose a Prosecco and were very pleased with the combination. Now you might think we had reached our limit, but you would be mistaken. As we headed toward home, the Market Pavilion Hotel rooftop beckoned with bright umbrellas. One more cocktail? A digestif perhaps? Up to the roof we went. Even on a damp, cloudy day, the Pavilion Bar is a pleasant oasis with efficient propane heaters and Plexiglas panels to shield and insulate the transparently private dining spaces. The atmosphere and spectacular view lured us into biting off more than we should chew, with a round of fresh cucumber martinis and—believe it or not—a flatbread with pancetta. Fully satiated, we walked along the water and reviewed the accomplishments of the day: six restaurants in little more than six hours. That’s nearly a week of dining experiences in a single afternoon. I was already looking forward to our next trip, because we’d still only had a taste of Charleston. If you like this article, take it with you on your next trip to Charleston by downloading the GPSmyCity app for your smartphone or tablet. For an in-depth look at Charleston’s restaurant scene, check out Tom Sietsema’s food tour of Charleston in the Washington Post. He visits Husk and FIG, along with twenty other restaurants, bars, and markets in his search for America’s best food cities. This sounds like food heaven!! Thanks Lucia! It was definitely a heavenly day.